After all of the big buildup, it's time to go to war. Beowulf tries to make peace with Elvina before the battle suggesting that they can work something out but they don't get to into detail because the war horn sounds. Beowulf, Slean and Brecca go out to meet Abrecan and his wolfling allies. As they wait for the wolfling army to assemble, Skellan decides to use the time to introduce the people of Herot to the warriors who will kill them. Skellan doesn't get far into his speech because throws a spear at the wulfling warrior. With the chit chat over, it's time to get down to battle. Slean runs around swearing to die for his people. Arla does her best to rehabilitate Slean's image with his mother. Arla suggests that it was abusive for Rheda to become Jarl and Thane and suggests that she do the right thing and hand over power. We all know that hell is going to freeze over before Rheda does that. Beowulf has a chat with Rheda, where she questions why he returned, given that she had him banished because of her selfish son. It's clear that Beowulf being Hrothgar's son may not be common knowledge, but Rheda has known all along. Beowulf responds that he came back for Hrothgar. The wulflings are distracted by the treasures of Herot and it's Abrecan who pushes to keep them on task. Despite the efforts of the people of Herot, they keep being pushed back by the combined armies. Rate and Varr arrive together. It seems that Rate has rethought the offer Rheda gave him. Rate agrees to have the Varni join the battle if, and only if, Rheda agrees to marry him and rule the territory jointly. Rheda tries to stall the process repeatedly and urges Rate to send a signal to his people but Rate will not be swayed and demands that they marry. The ceremony begins and Arla rushes out to find Slean to warn him that his mother is giving away his birth right. Slean storms in and accuses Rheda of selling her body and his birthright but Rheda is absolutely defiant. Slean accuses Rheda of never having any intention of handing out power and Rheda concedes that she planned on handing it over at first. An irate Slean followed by Arla storms out. Arla promises Slean that she will find a way to make him Thane and will take out his enemies. Given her little penchant for poison, I don't doubt Arla for one moment. Slean actually kisses Arla for the first time but says that what matters now is saving Herot. I guess Slean now finally accepts Arla as a partner. An injured Brinni heads to see Elvina for treatment. Elvina is attacked by a Wulfling and Grendel comes to her defense. When a Huscarla moves in to attack Grendel, Elvina kills him to spare her son. It only took 12 episodes but Beowulf: Return to the Shieldlands finally got around to naming Grendel. Beowulf sends Brinni away making him promise not to tell anyone what he has seen. An irate Beowulf then turns his attention to Elvina but she comes to the strong defense of her son before leaving Herot. Considering that Grendel is such a huge part of Beowulf's story, I cannot believe they waited 12 episodes to name him. It's ridiculous. I get that Beowulf: Return to the Shieldlands was trying to put a modern twist on an old story but some things are necessary for the sake of story telling. Lila is attacked and Brecca comes to her rescue. Brecca and Lila work together to fight off her attackers but Skellan sneaks up from behind and stabs Brecca. Lila is distraught at the sight of her downed husband but Brecca asks her to be quiet for his sake. Skellan asks that Beowulf be told that he did this in revenge for the murder of his brother and that Brecca's death will only make up half of what Beowulf owes him. Skellan storms out and Lila rushes to Brecca's side. Finally, the writers get around to showing us that these two people actually care for each other. It is yet another example of how much Beowulf: Return to the Shieldlands has failed when it comes to characterisation. At this point, I didn't actually believe Brecca to be in any real jeopardy because up until this point, Beowulf Return to the Shieldlands has shown fear of actually killing off people. Lila finds Bewoful and Vishka. Vishka escorts her mother to main hall while Beowulf heads to see Brecca. Beowulf tries to help but Brecca makes it clear that he accepts that this is the end of the road for him. Even in death, Brecca is completely unrepentant of the bad that he has done, claiming to have enjoyed it all far too much to express regret. Beowulf confirms that he is indeed Brecca's friend and Brecca is happy because Beowulf is his first and only friend. Brecca then dies. There's no time to mourn for Brecca because the people of Herot have been pushed back to the main hall. Though Rate has sent the signal for his people to join the fight because he has married Rheda, the Varni have not yet arrived. The Wulflings and the men of Bregan use a battering ram to try and open the door. Beowulf and Slean reminisce about Hrothgar and Slean calls Beowulf his brother in all but blood. Was the comment supposed to be irony? Rheda is dressing for her big moment and she is joined by Varr. Outside, Skellan has had enough of trying to get into the great hall and demands that it simply be set on fire. Abrecan is aghast with this suggestion, pointing out that if they burn down the hall, they will be killing his people. Skellan is quick to point out that the people of Herot have no love for Abrecan anyway suggesting that all Abrecan is going to rule is ash. Abrecan orders his men to keep using the ram. The Varni finally show up and Skellan's men peel off to deal with the Varni. Skellan tells Draven that once Abrecan breaches the doors that they are to burn him with his people. All dressed and ready, Rheda orders the doors be opened. Rheda marches outside and declares herself the true leader. Abrecan is full of confidence but Rheda will not back down. Rheda questions if the men of Bregan still think she is weak because she is standing there unarmed in front of them. An angry Abrecan gives the order for Rheda to be killed but one of the soldiers shoots Abrecan with an arrow instead. Rheda then takes a knife and stabs Abrecan even as he begs for his life. I couldn't help but shake my head at this scene. All Rheda has to do is present herself to the men of Bregan claiming her own office and they just stop wanting to kill her? How the hell does this even make any sense. Not only do they not want to kill Rheda they are suddenly against their Thane Abrecan. It's absolute nonsense and Rheda should have been killed the moment she opened the door. It's yet another example of the fact that many of the characters on this show are really to stupid to live. Beowulf is in the great hall when Skellan makes his appearance. The two begin to fight and when Beowulf's sword is broken, Slean tosses Beowulf their father's sword. Beowulf of course gets the upper hand on Skellan and kills him. Beowulf then returns the sword to Slean, who seems slow to take it back. Beowulf then heads to check on Elvina to find that she hasn't returned. In another part of the Shieldlands, Razzak goes to see a giant to ask his help in getting rid of the humans. Given that there isn't going to be a second season, this is a storyline that will not be explored. It's really a shame because Beowulf: Return to the Shieldlands when it was exploring themes around colonialism. At this point there's some confusion as to whether this is the penultimate episode of Beowulf: Return to the Shieldlands, or the last episode of the season. 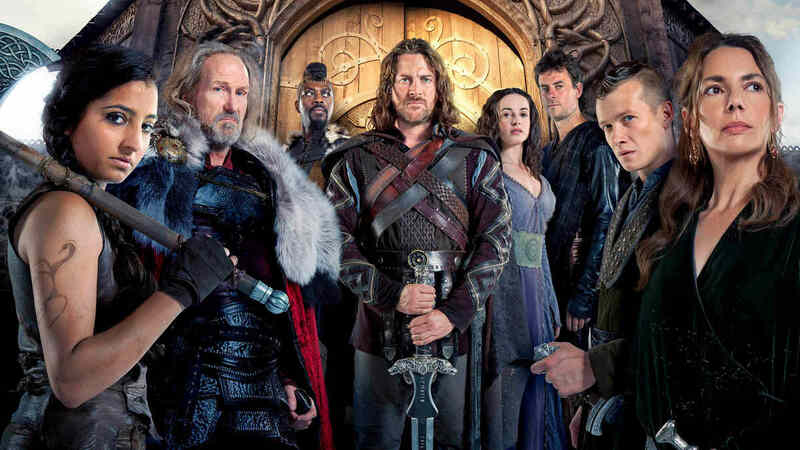 Either way, there's no hope for Beowulf: Return to the Shieldlands as it has already been cancelled. Despite all the hype from ITV regarding this show, and it's plan to tell an epic story lasting five seasons, Beowulf Return to the Shieldlands was disappointing at almost every level. From the horrible Game of Thrones like beginning to characters who are clearly to stupid to live, there's not much about Beowulf : Return to the Shieldlands to recommend it. It has been a seventeen million pound waste for ITV.